Or Do You Have a Horrible Boss? Horrible bosses come in all shapes and sizes. The only consistency among them is that they each have the ability to make your life a living hell. Although most of us would never think of harming another human being, one can’t help but day dream of the demise of a nasty boss. Considering the number of hours you work and the impact a bad boss has on your work life as well as your home life, it is no surprise that a few employees snap. In the movie, Horrible Bosses, three friends conspire to murder their horrendous bosses when they realize how miserable it is making their lives. I wonder how many people will feel a connection to the three friends. I suspect many more than bosses would like to believe. Research has indicated that the primary reason employees leave their jobs is due to their direct supervisor. Do you believe that to be true? Given that the current economic climate is making it difficult to find a job, would a bad supervisor still provoke you to go ahead and search for a new job? If yes, what is your timing? The Unprincipled Boss—Basically this boss has no values; you cannot trust what he says or does. Lying, cheating, and stealing could all be part of his makeup. Beware—you most likely will be blamed if he gets caught; he has no problem throwing you or anyone else under the bus. The Clueless Boss— She has no self-awareness or emotional intelligence. Empathy and understanding are foreign concepts to her. Beware – she is an emotional desert; you may have more success connecting or engaging with a mud fence than with her. She may berate you in front of others with no idea or consideration of the impact. The Non-communicator Boss—He is rarely seen. Preferring to keep to his office and communicating if forced by email only. Since he does not bring people together and does not communicate, people are left to their own devices. Beware – silos will emerge and confusion may result. You and others may become frustrated by the lack of clarity and lack of alignment. 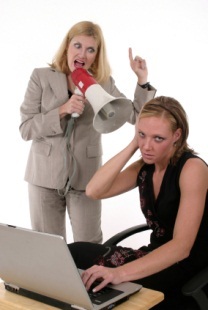 The Over-communicator Boss—She cannot handle any dead air space or quiet in the room. She talks to think and talks constantly. Beware – if you need time to think, then talk, she will exhaust you. Also, you may run down a lot of “rabbit holes.” Believing that she has asked you to take on a task, upon completion you find out she is surprised by your work. She was just “thinking” out loud, not requesting you to do something. The Disinterested Boss—He hates his job and/or he has checked out. Maybe he has been passed over for promotion or maybe he is just waiting to retire, for whatever reason, he could care less. Beware – his status in the company is low and by association so is yours. Any requests for help, guidance, mentoring may be met with disinterest. The Credit-taker Boss—Her ego is as big as Texas. Beware– If it is not her idea, don’t expect approval or support. And if she does approve it, don’t be surprise that it magically becomes hers. She stands tall because she is standing on top of you. The Flip-flopper Boss—He will do anything to avoid conflict. The last one to talk with him is where he currently stands. Although he may have principles, he just has difficulty standing up to strong, aggressive people. Beware – you may feel like you or your ideas are thrown under the bus (may feel similar to the unprincipled boss). The Incompetent Boss—She may be a good person, but she has no knowledge or experience for her current position. If she has other strong leadership capabilities, she may be able to overcome her incompetency. Beware – if combined with other horrible boss traits, she may implode and take you with her. The Perfectionist Boss – He has impossible standards and is chronically disappointed by everyone. Although he should delegate, he may instead take over everything—believing that if he wants it done right, he has to do it himself. He also can get into analysis paralysis asking for more and more information and avoiding making a decision. Beware – he can be very hard on himself and others and may block your growth due to his work style. These are just a few of the types of horrible bosses. To complicate or explain matters, some bosses are combinations of one or more of the above. As frightening as that may sound, it may explain your boss. The first step is to understand what kind of boss you have and then to determine your best way of dealing with it. Maybe you can help or maybe it is time to leave. Life is too short to be miserable. Just make sure you aren’t making anyone who reports to you miserable as well. For information on what makes a great boss, go to www.leaders-inc.com and also read 18 Holes for Leadership by Nancy L. Clark. Copyright ©2011, Nancy L. Clark. All rights reserved.